The only gluten-free banana bread recipe you’ll ever need; a one bowl wonder! No mixer required for this super moist easy gluten-free banana bread. With a dairy-free option too. Recipe originally posted April 2017, photos updated April 2018. Banana bread is a favorite of mine from childhood. I love the smell of banana bread cooking in the oven. We eat a lot of bananas in my home, but there is always a few that get a little too ripe for my kid’s liking. So what’s a mama to do? I make gluten-free banana bread. It was easy to modify my favorite banana bread recipe to make it gluten-free. Trust me, no one will even know it’s gluten-free. 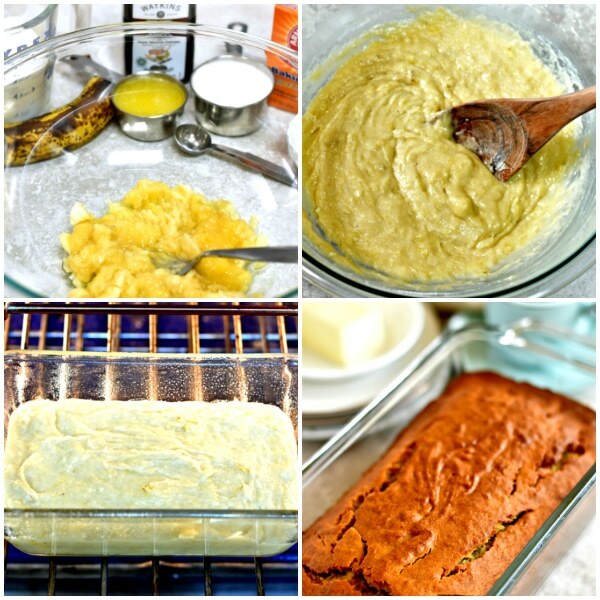 How To Make Gluten-Free Banana Bread In 3 Easy Steps! This gluten-free banana bread recipe is a one bowl wonder that is super easy to make, you don’t even need a mixer. 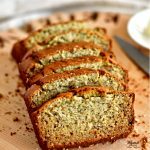 You can quickly whip up this super moist gluten-free banana bread in just three easy steps and with just a fork and a spoon. Three mashed bananas are equals to 1 cup. You can also mix it up a little by adding mini chocolate chips, blueberries, nuts, or raisins. 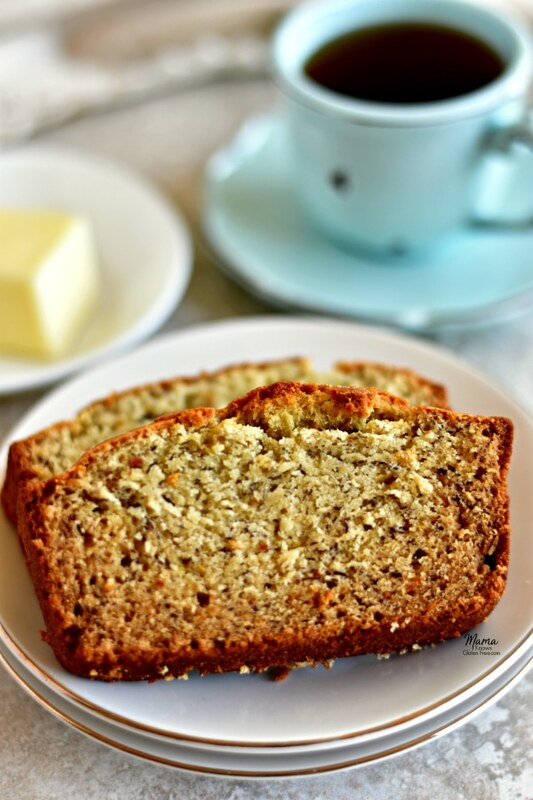 I love how easy this super moist gluten-free banana bread is to make! My husband, my youngest son, and I are all dairy-free, so I always try to include a dairy-free option to my gluten-free recipes. So, you too can enjoy a gluten-free and dairy-free banana bread. My favorite dairy-free products to bake with are almond and cashew milk and either coconut oil or Smart Ballance or Earth Balance butter. I hope you enjoy this easy gluten-free banana bread as much as my family does. Try some of my most popular gluten-free recipes! Spray a 4 x 8 loaf pan with cooking spray. In a mixing bowl, mash the ripe bananas until smooth. Add the baking soda to the mashed bananas. Stir in the sugar, salt, eggs, and pure vanilla extract. Mix in the gluten-free flour and xanthan gum(leave out if your flour already has it in it). Bake on the center rack for 50 minutes to 1 hour or until a toothpick inserted in the center comes out clean. Please watch your banana bread because all ovens are different. Cool completely before slicing. Enjoy! Three mashed bananas are equal to 1 cup. Pro Tip: You can also mix it up a little by adding mini chocolate chips, blueberries, nuts, or raisins. Mama says "Check all of your labels." I was wondering how long this bread stays fresh and should it be stored in the refrigerator? I added semi sweet mini chocolate morsels to my bread and its a hit! Hi LC! You should be able to store it in an air-tight container for a few day. It never lasts that long in my house. I add chocolate chips to it sometimes too. I’m so glad that you enjoyed it! Have you tried/had success making this or your blueberry muffin recipe with an egg substitute? Flax egg or aquafaba perhaps? I’m struggling to find a successful gf/egg free muffin recipe that doesn’t come out heavy and gummy. Hi Jenn! I have not tried egg replacers with this recipe. My friend who blogs over at Allergylicious likes to bake with Ener-G egg replacer. 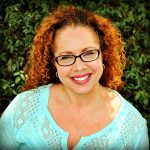 Here is a link to her blog about her recommendations for baking/cooking egg-free. https://allergylicious.com/egg-free-baking Please let me know if you try it and how it turns out. Thank you so much for asking! Where is the gluten free DAIRY FREE option you state is available???????? Hi Jania. The dairy-free option for this recipe is stated in the ingredients list. I recommend substituting dairy-free butter such as Earth Balance, Smart Balance or even coconut oil in the ingredient list on the recipe card. My husband, youngest son and I are also dairy-free so I always try to have a dairy-free option to my recipes when possible. I have a few gluten-free and dairy-free friends, this awesome banana bread recipe will definitely come in handy! Hi Jillian. I hope they enjoy it! Hi Lize. It is 350 degrees Fahrenheit, so it would be 177 degrees Celcius. I hope you enjoy the gluten-free banana bread! I used egg replacer and added 1/8tsp baking powder and no one even knew that it was free of gluten, dairy, and egg. It is moist, light, and everything you would ever want in banana bread! I can honestly say, This is the most amazing gluten free, dairy free and egg free bread i have ever tasted!! Hi Melissa. Thank you so much for the wonderful recipe review! This makes my heart so happy to hear that you enjoyed the banana bread. I am so glad that the egg replacer worked well in the recipe. I have never baked with egg replacer. Which brand of egg replacer did you use? My children have a lot of allergies, but this bread made with the egg replacer avoids them and we have a delicious treat. Thank you! Do you have a cake recipe by chance? Thank you Melissa for letting me know what egg replacer you use. If you enjoyed the banana bread you would probably really like my gluten-free blueberry banana muffins too. I have several cake recipes. Most of them have a gluten-free option. Click HERE to see the gluten-free cake recipes. Do you have a favorite cake you are looking for? I TRIED THIS gluten free banana bread! The best and easiest gluten free loaf I have ever made! Excellent recipe. 5 stars all the way. Taste, texture and so easy! A BIG THUMBS UP,! Has anyone tried almond flour? Just made the bread. Used olive oil instead of the butter (just slightly under the measurement). This is hands down the BEST banana bread I have ever had – including my Nana’s regular gluten containing bread (sorry Nana). This was easy to whip up and absolutely delicious! I used King Arthur’s gluten free baking blend. Thank you so much for this awesome recipe!!! Thank you so much Erica for the wonderful 5-star recipe review! This makes my heart so happy, I am so glad that you enjoyed the banana bread. I’ve never tried it with olive oil, but I am definitely going to try it. You are so welcome, I love sharing what I make for my family. Thank you again for the lovely review! Thank you so much for the wonderful 5-star recipe review! I am so happy that you enjoyed the banana bread. I am looking forward to hearing how you like other recipes that you try. Thanks again! Thank you so much Trish for the wonderful 5-star recipe review! I am so happy that you and your family enjoyed the banana bread. It makes my heart so happy to hear that you are inspired to bake again! You really made my night. Thanks again! I am wondering if you have tried adding pumpkin to make pumpkin banana bread? i searched but didnt find a recipe. Hi Toni! I’m working on a pumpkin bread recipe. It should be up on the blog very soon (we just went through hurricane Micheal). Thanks! Soooo Good! I am not gluten free, but husband is gluten and dairy free. Usually when I make him a dessert, I don’t eat it because the regular gluten desserts are so much better. Not true with this one, I matched him slice for slice. My kids loved it also. Used coconut oil and was perfect! Thank you!! Thank you so much Elizabeth for your wonderful 5-star review! I am so happy that you and your family enjoyed the banana bread. It’s one of my family’s favorite treats! You are so welcome, I love sharing what I make for my family. Do you have any guidance for a substitute and quantity to replace the refined sugar in the recipe? Hi Maria! I have made the recipe with 1/2 cup of pure maple syrup. I need to add that to the recipe. I have not tried it with coconut sugar, but I have baked with it before. Thank you so much for asking! I hope you enjoy the banana bread and please let me know how it turned out with the maple syrup. Thanks! This recipe is fantastic.!! This comes from a family gal whose Sisteris a well known and accomplished Pastry Chef in the NY Metro area. We are hard to please :). I used Coconut Sugar instead of white sugar as I had made it right away and am making another batch with Maple Syrup. Keep up the good work and big thanks for a superb recipe! Thank you Maria for your amazing 5-star recipe review! You just made my day and so blessed me with your kind words! I am happy to hear that the coconut sugar worker well in the recipe. I bake with it also. You are so welcome, I love sharing what I make for my family. This makes my heart so happy to hear Jodie! I am so happy that you enjoyed banana bread. You are so welcome, I love sharing what I make for my family. Thank you so much for the wonderful 5-star recipe review! Perfect recipe. Delicious and stays together well. 50 mins was perfect in my oven. Thank you so much Emily for the wonderful 5-star recipe review! I am so happy that you enjoyed the banana bread. Thank you again! Great banana bread. Moist and delicious. Thank you so much Laurie for the wonderful 5-star recipe review! I am so happy that you enjoyed the banana bread. It’s one of my family’s favorite treats. Thank you again! I just made this and it is fabulous just as written! Thank you!! Thank you so much Brenda for the wonderful 5-star recipe review! I am so happy that you enjoyed the banana bread. You are so welcome I love sharing what I make for my family. Thank you again! Hi Colleen! I do not recommend using this recipe with coconut flour. Coconut flour is very dense and does not bake like gluten-free rice flour. I use Pillsbury gluten-free flour and I recommend using that with this recipe or using a gluten-free rice flour blend that has similar ingredients. I do have recipes that use almond flour like my Paleo Blueberry Banana Muffins. I just made this banana bread today and it is remarkable! Easy recipe to follow, easy to make! Thank you Mama knows gluten free for sharing this amazing recipe! Thank you so much Jamie for the wonderful 5-star recipe review. 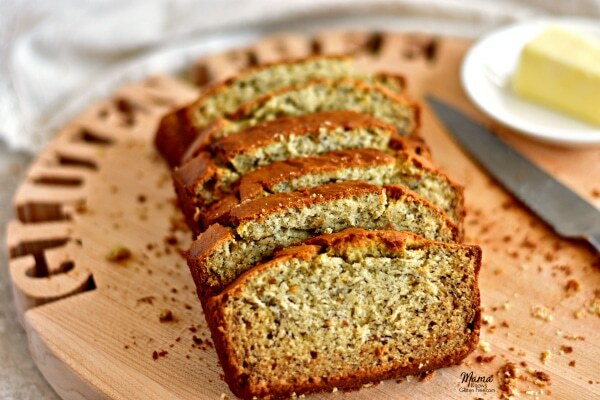 I am so happy that you enjoyed the banana bread and that you found the recipe easy to follow. You are so welcome I love sharing what I make for my family. Thank you again!